Research on Ganoderma is briefly reviewed. The mushroom’s antitumour, cardiovascular, immunomodulatory and anti-HIV effects were critically evaluated. Each paper read was partly judged on the reliability of the journal in which it was published; so-called "impact factors" being used as a measure of credibility. Theoretical evidence raises the possibility that Ganoderma does have medicinal potential, however there is a lack of reliable clinical evidence to support this. A lot of claims are made regarding the value of Traditional Chinese Medicine (TCM). The purpose of this study was to evaluate the medicinal potential of the fungus Ganoderma – a highly regarded remedy in TCM. A wide range of medicinal remedial qualities have been claimed and researched for this fungus. However this study focuses on the more significant and better-researched claims in detail. Due to the lack of literature in textbooks on Ganoderma most of the information has been derived either from literature reviews or straight from experimental research papers. This presented its own problems – a section on the use of sources has therefore been included. First, however, I present a general introductory section on TCM and Ganoderma. Inappropriate claims regarding the efficacy of traditional Chinese medicine (TCM) are often made1. Although it may be easy for this to make us dismissive of all that TCM claims to offer we should think twice before doing so. Especially as TCM has been shown to yield results where orthodox Western medicine has failed [1, 2]. In fact some  point out that "...Traditional Chinese medicine is, for those who have mastered it, a medical paradigm complete with theoretical foundations derived from empirical observations and creative synthesis..." and go on to claim that TCM will "...be the most important contribution to the betterment of mankind by the Chinese civilization in the coming millennium". However others  contest such positive views by pointing out that the alleged medical paradigm complete with theoretical foundations derived from empirical observations and creative synthesis is a fiction because "...The quality of those observations is insufficient, based on uncontrolled observations, moulded in myth, and manipulated by social influences..." . Although TCM is making some modest inroads into Western medicine (for instance a dedicated TCM hospital has been opened in Paris ), Western medicine has eroded the role of TCM in China itself where it accounts for only 40% of all health care delivered today. Furthermore, the current Chinese government policy of expanding TCM manpower and facilities is being called into question since "many hospitals using TCM are already underutilized and depend on government subsidies for survival" . This change in medical ideology is significant since the origins of TCM date back as far as 2700 BC when Shen Nong Ben Cao Jing wrote The Herbal Classic Of The Divine Ploughman. Moreover, only this century, the Communist party organ in China, The Dialectic Of Nature denounced Western medicine as tainted by "bourgeois metaphysics" . Perhaps this transition could be seen as an implicit recognition of the limitations of TCM. One specific remedy used in TCM is the mushroom Ganoderma (also known as Ling Zhi in China and Reishi in Japan). Like TCM itself it is surrounded by all sorts of claims, counter-claims and controversy regarding its healing qualities. Ganoderma has been use since the 4th century A.D. and is well known in China; "...so extensive are the medicinal claims for this fungus, this mushroom is also called the Panacea Polypore..." and "...the Mushroom of Immortality." . There are several species of Ganoderma fungi (some of which are shown in Fig. 1). However the vast majority of the research done on Ganoderma’s medicinal qualities has been performed using G. lucidum. Investigating the properties of Ganoderma is fraught with difficulties. One problem is that the fungus contains varying amounts of its biologically active components during its life cycle . There is further evidence of this variation – six colours of Ganoderma can be grown from the same species (notice the difference between the adjacent G. lucidum images in Fig. 1). In TCM these are considered to have varying degrees of healing power, in fact the price can vary quite considerably. It could be argued that this natural variation might produce inconsistencies in some of the research: two identical methods might yield different results due to variation in the Ganoderma used. Ganoderma in nature. On the tree trunk Ganoderma grows like a bracket fungus, without a stem. On the tree roots it forms a stem. Photographed by Dr S.W. Chiu. 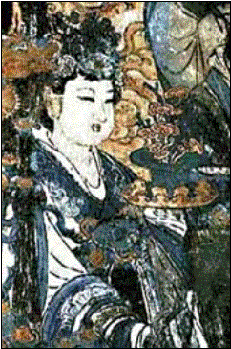 Wild Ganoderma is sufficiently rare for it to be limited (by its cost) to the rich nobility in the days before its widespread cultivation. Fig. 1. Fruit bodies of Ganoderma species. Showing the natural diversity in colour and form. 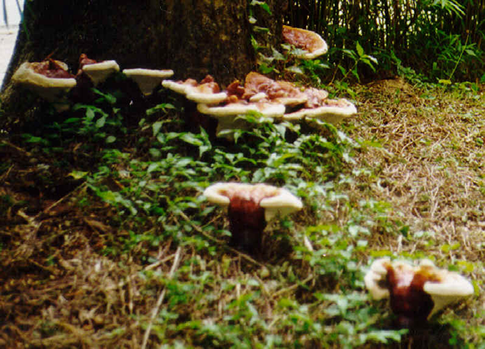 Large-scale scientific investigation of the effects of Ganoderma became possible during the eighties when Prof. Pan Zihang developed a technique to mass-produce this mushroom and to harvest its therapeutically valuable spore . However the provenance of some of these studies leaves a lot to be desired. Among cultivated mushrooms Ganoderma is unique in being consumed for its pharmaceutical value rather than as a food. Several species of Ganoderma are used in the increasingly important commercial nutraceutical business. Another Internet source claims that the market value of mushroom dietary supplements (nutriceuticals) worldwide was about US$ 1.2 billion in 1991, rising to US$ 3.6 billion in 1994. In 1999, it was estimated the medicinal mushrooms, extracts and products based on these amounted to worldwide sales of US$ 6.0 billion. About 75% of Ganoderma production occurs in China; so it can be argued that China has economic as well as cultural reasons to propagate the supposed medicinal qualities of Ganoderma. Ganoderma is one of the most highly regarded herbal remedies in TCM. Consequently, a lot of literature investigating its properties is published in Asian journals. As was pointed out earlier the Chinese have both economic and cultural motives to promote Ganoderma’s healing properties. In fact, one could also argue that the Japanese also have an economic interest in the production of the mushroom. That is not to say that all the studies done in these countries were unreliable, far from it. However, one has to be selective since the provenance of the studies is so varied. Some research papers are riddled with Communist rhetoric, for example "Under the guidance of Chairman Mao’s revolutionary health line [although it has been claimed that "Mao enjoyed the best scientific methods [of medicine] while extolling the virtues of TCM for the masses" . In the light of these sentiments some papers could be taken with a large pinch of salt! Studies are sometimes funded either by bodies with a commercial interest in Ganoderma [e.g. ref. 7] or by Chinese government grants . However one such study was published in the International Journal of Cancer (a leading periodical on cancer research) despite being financially supported by the Chinese government . Therefore, it would not be fair to distrust a study simply because it is financially supported by such bodies. Another method of measuring the reliability of Ganoderma research was needed. It was decided to rate the reliability of each paper according to the "impact factor" (IF) of the journal from which it was taken [impact factor values were obtained from the Journal Citation Reports website, which is now published by Thomson Reuters]. Impact factors effectively estimate how widely read a particular journal is among the scientific community. This is worked out by using the number of times a journal is cited in other papers and setting this against the number of papers that the journal itself cites in the papers it publishes. World-renowned journals such as Nature are widely read and are therefore frequently cited - thus they have high IFs. Nature published 885 papers in 1997, was cited in 27999 other papers published that year and consequently scored an impact factor of 28.833. It was decided to treat journals with IFs greater than 1 as "reliable". An IF of 1 means that on average there is one citation for every paper published by that journal. This "yardstick of reliability" is itself limited. One could argue that Ganoderma "enthusiasts" reads "pro-TCM" journals. When such journals publish a paper on the topic that article will be subsequently widely quoted by the "pro-Ganoderma" scientists in their own work. This might improve the impact factor of that journal even if the work is flawed. Another limitation of this way of measuring the reliability of an article was noted while carrying out this investigation. Advances in Applied Microbiology seemed reliable (IF = 1.654). However, general review articles can use information uncritically from articles which may have been published in relatively obscure journals. Due to these limitations IFs were used as a guide to reliability rather than proof of it. Fig. 2. 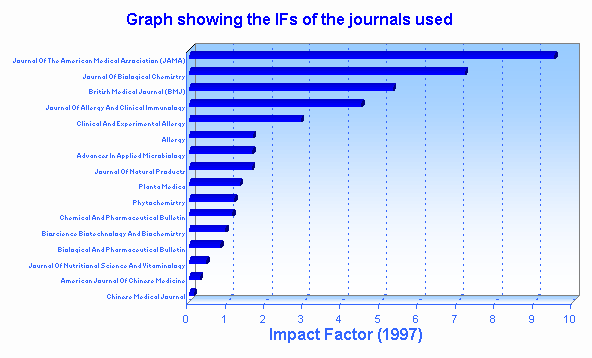 Impact factors of the Journals used in the literature survey. Perhaps the most significant claim made of Ganoderma is its value as an antitumour agent. The idea of anticancer drugs being derived from mushrooms seems a little surprising at first. However in Japan the Health and Welfare Ministry have approved three different anti-cancer drugs extracted from mushrooms. These three are lentinan, derived from Shiitake (Lentinula edodes) ; schizophyllan, derived from Suehirotake (Schizophyllum commune); and PSK (a polysaccharide complex with immune stimulating effects), derived from Kawaratake (Trametes (or Coriolus) versicolor). PSK is the best-selling cancer drug in Japan and is also sold in Europe but has not yet penetrated the US market. It seems plausible that Ganoderma could be similarly useful and, in fact, the potential of Ganoderma as an antitumour agent is the mushroom’s most researched quality. Some encouraging results have been obtained through in vitro studies. The best example of these is the work done by Wang et al (1997)[ref. 8] which was published in the International Journal of Cancer (IF = 3.283, indicating that the publication is reliable). They found that polysaccharides from Ganoderma alone (PSG) had little effect on the proliferation of cancer cells. The same was true for T cells and macrophages. However when these were combined (PSG, T cells and macrophages) an antitumour effect was noted. They concluded that this was the result of cytokines released by T cells and macrophages and that this release was stimulated by the presence of the PSG. Fig. 3 shows this combined effect (MNC-CM = mononuclear cell-conditioned media). They also demonstrate that treatment with PSG-MNC-CM markedly induced leukemic-cell apoptosis. However they also claim that "experimental studies have repeatedly shown that PSG has the ability to suppress tumour growth in vivo; while this is true, it is also arguably a little misleading. mean ± S.E.M. Data and figure legend adapted from Wang et al., 1997 (ref. 8). Several studies have demonstrated that Ganoderma has antitumour effects in vivo. These mostly show antitumour activity against sarcoma 180 in mice. However, once again many of these studies are only to be found in relatively obscure journals, such as Han’guk Kyun Hakhoe Chi (the Korean Journal of Mycology) for instance. Only one paper has reproduced these encouraging results and been published in a relatively well-known journal - Bioscience Biotechnology and Biochemistry (IF = 0.949). Zhang et al. (1994)  tested sixteen polysaccharides of which they found three had antitumour effects on sarcoma 180 in mice – one produced a survival ratio 194% of that of the control group. It has also been claimed that Ganoderma not only has antitumour effects but also has radioprotective properties in vivo . However this has only been successfully demonstrated in one study that was published in the American Journal of Chinese Medicine (IF = 0.293) – showing that this finding is of dubious reliability. Furthermore, a study by Chiu et al. (2000) found no evidence at all for the Ganoderma extract having any value in protecting against the radiomimetic mutagen used (ethyl methanesulfonate - EMS) . Extensive research has been published on the structure of the supposed antitumour polysaccharides of Ganoderma. This seems somewhat surprising given the almost complete lack of in vivo evidence of the mushroom’s antitumour effects in reliable journals. While there is some encouraging in vitro data it is not enough to substantiate the miraculous antitumour claims that are made for Ganoderma. Hypotensive Action of Ganoderma lucidum. Another medicinal property of G. lucidum that has been claimed and researched is its hypotensive action. Lee et al. (1990)  carried out research that suggested the mycelium extract from G. lucidum inhibited sympathetic outflow and concluded that this was responsible for the hypotensive effect. They used anaesthetised rabbits and rats, cannulated the left femoral artery and vein for measurement of arterial pressure and delivery of drugs. The left kidney was then exposed retroperitoneally and a branch of the renal nerve was used to measure renal afferent or efferent activity. They found that the mycelium extract decreased diastolic and systolic blood pressure and this was accompanied by an inhibition of renal efferent sympathetic nerve activity. Moreover they found that the hypotension occurred in an extract dose dependent manner. This in vivo study seems to have yielded conclusive results. The fact that the paper was published in Chemical and Pharmaceutical Bulletin (IF = 1.135) and that the work was done in the USA adds further to its credibility. However a different study  performed earlier in vitro seems to suggest another way in which G. lucidum may have hypotensive effects. Morigiwa et al (1986)  demonstrated that a 70% methyl alcohol extract of G. lucidum inhibited angiotensin-converting enzyme. This would limit blood pressure by blocking the renin-angiotensin system. They also isolated and characterised eight lanostane triterpenes that had ACE inhibitory effects. Of which they found that ganodermic acid F had the greatest effect. Again this study was published in Chemical and Pharmaceutical Bulletin suggesting that the study is reliable. Both the studies discussed so far have used carefully prepared extracts of G. lucidum that was given intravenously (not a satisfactory solution for chronic hypertension); furthermore the effects have only been demonstrated in vitro. However, another investigation by Kabir et al (1988)  demonstrates hypotensive effects in a much less sophisticated and more practical way. Kabir et al  studied the effect of a powder prepared from the cultured fruit body of G. lucidum on the blood pressure of spontaneously hypertensive rats. After a 4-week feeding period, the systolic blood pressure of the rats was significantly lower than the control, indicating that the powder contained a substance that suppresses the elevation of blood pressure . This is especially conclusive since while the studies by Lee et al (1990)  and Morigiwa et al (1986)  yielded significant results they did not prove that the effects they describe could be achieved by oral consumption of G. lucidum. Hypertension is an important risk factor in several diseases, most notably in the development of atherosclerosis. This is a highly significant disease process since atheroma of the coronary arteries leads to myocardial infarction - the biggest killer in the UK. Although western medicine already has effective hypotensive drugs and ACE inhibitors, it is often preferable to give a pharmaceutical agent by dietary methods rather than in highly refined forms. This makes it much harder to overdose. Oral consumption of G. lucidium, it seems, may provide a safe but effective way of lowering blood pressure. One could argue that this has highly significant implications for western medicine. Hypocholesterolaemic activity. During their work on Ganoderma hypotensive activity, Kabir et al (1988)  investigated its effect on the lipid levels of the spontaneously hypertensive rats. After being fed the powdered fruit body for four weeks the plasma total cholesterol levels were of these rats was significantly lower than the controls. Other investigators such as Shiao et al. (1988a & b) [14, 15] and Lin et al. (1988)  have isolated specific triterpenes that have hypocholesterolaemic effects (Fig. 4). Fig. 4. Lanostanoid triterpene skeleton representative of the triterpenes isolated from the mycelia of the fungus Ganoderma lucidum. Substituents at R1 and R2 are combinations of H, OH, O and OCH3. For example in ganodermic acid, R1 = H + OCH3, and R2 = OCH3. Adapted from Lin et al. 1988 [ref. 16]. These studies were all published in respectable journals (IF>1) thus their findings seem significant. Hypercholesterolaemia is another recognised risk factor for atherosclerosis - a major killer in the UK, as has been mentioned. If Ganoderma has both hypocholesterolaemic and hypotensive activities then it should also significantly reduce the incidence of atherosclerosis – the implications of which would be very important. Platelet aggregation inhibitory effects of Ganoderma lucidum. Several studies have examined the effects of G. lucidum on platelet aggregation. Shimizu et al. (1985)  described how the water-soluble fraction of the fruit body of G. lucidum suppressed platelet aggregation. While they did not determine the mechanism, they did find that the chemical that inhibited the platelet aggregation was adenosine. Furthermore they showed that the content of adenosine was 40 mg/1000 g of the dried fruit body preparation. This effect would be very significant since inhibition of platelet aggregation reduces the incidence of blood clots and strokes. Again, though, hypercoaguability is a problem for which western medicine already has solutions. However, these findings are also significant in another way. If G. lucidum does inhibit platelet aggregation, patients with clotting disorders such as haemophilia, or those who are taking anticoagulants, should be strongly advised against using Ganoderma as a complementary medicine. Immunomodulatory protein LZ-8. Perhaps one of the most fascinating discoveries in work on Ganoderma is the discovery of an immunomodulatory protein known as Ling-Zhi-8 (LZ-8). This protein was first isolated from the mycelial extract from G. lucidum by Kino et al. (1989)  and has been shown to have some surprising biological properties. Kino et al (1989)  demonstrated that LZ-8 could prevent the production of a systemic anaphylaxis reaction in mice if administered repeatedly. About 40% of the LZ-8 treated mice were Arthus reaction positive compared to 90% in the control group. They concluded that this showed that LZ-8 reduces antibody production but does not block it completely, although they were unsure of the mechanism for this. They also describe how LZ-8 is a "pseudo-lectin": it shows mitogenic capacity towards mouse spleen cells and human peripheral lymphocytes but is not inhibited by mono- or dimeric sugars. Perhaps even more significantly they claim to have demonstrated that LZ-8 can prevent the onset of autoimmune type I diabetes. Tanaka et al. (1989)  determined the complete amino acid sequence of LZ-8. The sequence showed great similarity to the variable region of immunoglobulin heavy chain both in its primary and predicted secondary structure. Although they do not attempt to use this discovery to help explain LZ-8’s biological properties it would be fair to suggest this is not mere coincidence. It should be noted that these studies appeared in the Journal of Biological Chemistry (IF = 7.199). Using the IF scale implies that they may be the two most reliable papers that have been written on Ganoderma. Furthermore they have demonstrated that LZ-8 shows in vivo effects – most other studies on the biological properties of Ganoderma tend to be based on in vitro data. Their findings should therefore be considered seriously. LZ-8 seems a remarkable discovery, but many questions remain unanswered. For instance why does G. lucidum posses such a protein. The similarity between LZ-8 and Ig VH is even more striking when one considers the "immense genetic distance between vertebrates and basidiomycetes" . It seems plausible that a better knowledge of how LZ-8 works could prove invaluable in explaining G. lucidum biological properties. Histamine-release inhibition activity. Kohda et al. (1985)  has demonstrated that a methanol extract of G. lucidum has an inhibitory action on the release of histamine by mast cells in vitro. Four triterpenes were isolated, ganodermic acids A, B, C and D, that were suspected candidates for this effect. This study appeared in Chemical and Pharmaceutical Bulletin (IF = 1.135) and was conducted using a sound method; the test used was a simple in vitro assay for anti-inflammatory or antiallergic drugs, thus their results seem reliable. Other studies by Tasaka et al. (1988) [22, 23] concluded that this inhibition of histamine release was the result of membrane stabilisation. Theoretically this means that G. lucidum may have antiallergic properties in vivo. This could be used to explain the claim that the mushroom can relieve asthma, which is sometimes treated with mast cell stabilisers. However this only demonstrates in vitro histamine-release inhibition. None of the studies on the effects of Ganoderma on histamine release to date have reproduced these effects in vivo. Ironically a handful of studies have shown that, far from being antiallergic, Ganoderma can provoke a hypersensitive response in humans. Sensitisation. While most papers on Ganoderma focus on the mushroom’s healing quantities a few have shown that it can have unhelpful effects on some people. Human sensitisation to Ganoderma antigen was first reported in the Journal of Allergy and Clinical Immunology (IF = 4.509) in 1979 in a study carried out in Ontario . Patients attending chest/allergy clinics were tested and it was found that 8.2% reacted positively to the Ganoderma antigen. This allergic reaction occurred in 16% of those tested in a similar study in Auckland . In 1995 sensitisation was reported in India in a paper published in Clinical and Experimental Allergy (IF = 2.939); it was found that 28.48% and 17.44% of patients showed marked skin reactivity to spore and whole body extracts, respectively . A lot of the treatments commonly used in Western medicine are linked with allergies, penicillin is one such example. It does not seem surprising therefore that G. lucidum is also linked to allergy. However it is important to bear this downside in mind when considering the various healing claims made of Ganoderma. Sceptics may argue that it is not surprising that Ganoderma has been linked to anti-HIV activity since it already supposedly alleviates or cures all other diseases; why should HIV be any different? However, two studies have isolated anti-HIV protease substances from the fungus. Moreover, both these articles were published in widely read journals: Phytochemistry (IF = 1.179) and Chemical and Pharmaceutical Bulletin (IF = 1.135). This suggests that there may be something in these claims after all. Both studies Min et al. (1998)  and El-Mekkawy et al. (1998)  had similar findings, in fact the two teams also had common group members. Min et al (1998) found five triterpenes that had anti-HIV-1 protease activity. El-Mekkawy et al. 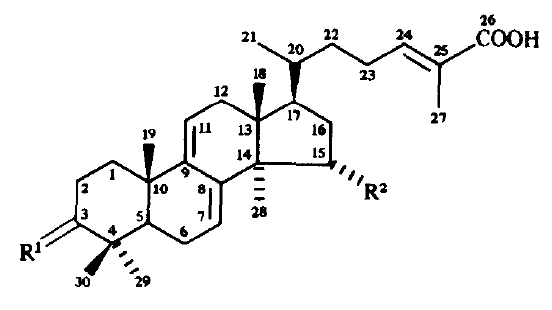 (1998) isolated anti-HIV-1 protease triterpenes. However they also found that ganoderiol F and ganodermanontriol displayed anti-HIV-1 activity . While these effects have only been demonstrated in vitro they do provide enough evidence to give some theoretical basis to the latest claims regarding Ganoderma’s medicinal properties. Only two classes of drugs are currently used to treat HIV infection in western medicine: one class is protease inhibitors, such as Indinavir. These interfere with HIV replication by inhibiting post-translational processing of viral precursor polypeptides . Hence it could be postulated that since Ganoderma also has anti-HIV-1 protease activity it could, indeed, be used to treat HIV infection via the same mechanism. During the past 50 years, several major advances in medicine have come from filamentous fungi (penicillin, cyclosporine, statins) and yeasts (cell cycle, eukaryote structure, genomics). For instance antibiotics such as penicillin, tetracycline and aureomycin were derived from moulds and caused what can only be described as a revolution in health care treatment, which is now being repeated with the revolution in treatment offered by statins. In between these two revolutions is cyclosporine; a powerful immunosuppressive drug. By serving as easily-manipulated model systems, research on yeasts has revealed molecular details of the cell cycle, eukaryote structure, and genomics. Therefore it would be by no means unprecedented if Ganoderma also had something to offer in the form of a positive pharmacological effect. There is a lot of evidence to suggest that Ganoderma does have medicinal potential, there have been several good studies with positive results. Its cardiovascular effects seem particularly significant since cardiovascular disease is the biggest cause of mortality worldwide. Therefore anything that helps lower the risk factors associated with the development of cardiovascular disease, such as hypertension and hypercholesterolaemia, is worthy of a least some consideration. Also worthy of note is the discovery of LZ-8. The fact that this celebrated fungus has an immunomodulatory protein seems most unusual. Perhaps it could be used to explain a lot of Ganoderma’s supposed healing qualities. However while there is compelling research that seems to substantiate the claims made of the mushroom there is still no proof. In fact there is some evidence against. Furthermore the supporting evidence is mostly based on in vitro studies; the research on HIV is one example of this. Even the in vivo experiments have been performed using mice. If Ganoderma really were the Mushroom of Immortality surely there would be at least some good clinical evidence for it. But too many of the studies were published in relatively obscure journals and used only small sample groups . 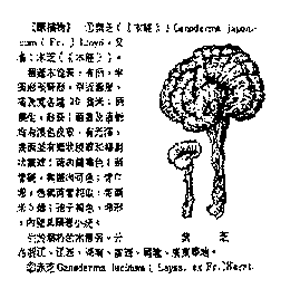 Die-hard TCM advocates might argue that the clinical evidence for Ganoderma’s success lies in the 4000 years of human observation upon which TCM is based. However there is a complete lack of quality research to show that Ganoderma has any positive effects in Homo sapiens. The research to date on Ganoderma provides theoretical evidence that the fungus might have medicinal potential. However, the lack of solid clinical evidence is disappointing and forces one to be very sceptical about its usefulness as a remedy for any human ailment. Hui, K.K. (1997). Is there a role for Traditional Chinese Medicine? [letter] Journal of the American Medical Association, 277: 714. DOI: http://dx.doi.org/10.1001/jama.1997.03540330036029. Chan, K. (1995). Progress in traditional Chinese medicine. Trends in Pharmacological Sciences, 16: 182-187. DOI: http://dx.doi.org/10.1016/S0165-6147(00)89019-7. Sampson, W. & Beyerstein, B. (1997). Is there a role for Traditional Chinese Medicine? - Reply [letter]. Journal of the American Medical Association, 277: 714. DOI: http://dx.doi.org/10.1001/jama.1997.03540330036030. Dorozynski, A. (1995). French to get hospital for Chinese medicine. [news section] British Medical Journal, 310: 1285. URL: http://www.bmj.com/content/310/6990/1285.1.full. Hesketh, T. & Zhu, W.X. (1997). Health in China: traditional Chinese medicine: one country, two systems. British Medical Journal, 315: 115-117. URL: http://www.bmj.com/content/315/7100/115.full. Stamets, P. (2000). Growing Gourmet and Medicinal Mushrooms. Ten Speed Press. ISBN-10: 9781580081757, ISBN-13: 978-1580081757. View on Amazon. Min, B.-S., Nakamura, N., Miyashiro, H., Bae, K.-W. & Hattori, M. (1998). Triterpenes from the spores of Ganoderma lucidum and their inhibitory activity against HIV-1 protease. Chemical and Pharmaceutical Bulletin, 46: 1607-1612. URL: http://www.journalarchive.jst.go.jp/jnlpdf.php?cdjournal=cpb1958&cdvol=46&noissue=10&startpage=1607&lang=en&from=jnlabstract. Wang, S.-Y., Hsu, M.-L., Hsu, H.-C., Tzeng, C.-H., Lee, S.-S., Shiao, M.-S. & Ho, C.-K. (1997). The anti-tumor effect of Ganoderma lucidum is mediated by cytokines released from activated macrophages and T lymphocytes. International Journal Of Cancer, 70: 699-705. DOI: http://dx.doi.org/10.1002/(SICI)1097-0215(19970317)70:6<699::AID-IJC12>3.0.CO;2-5. Zhang, J., Wang, G., Li, H., Zhuang, C., Mizuno, T., Ito, H., Mayuzumi, H., Okamoto, H. & Li, J. (1994). 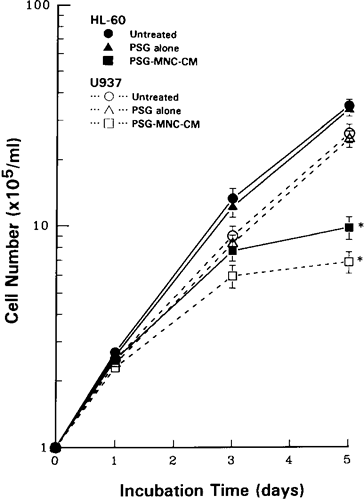 Antitumor active protein-containing glycans from the Chinese mushroom Songshan Lingzhi, Ganoderma tsugae mycelium. Bioscience Biotechnology and Biochemistry, 58: 1202-1205. URL: http://www.journalarchive.jst.go.jp/jnlpdf.php?cdjournal=bbb1992&cdvol=58&noissue=7&startpage=1202&lang=en&from=jnlabstract. Hsu, H.Y., Lian, S L. & Lin, C.C. (1990). Radioprotective effect of Ganoderma lucidum (Leyss. ex. Fr.) Karst. after X-ray irradiation in mice. American Journal of Chinese Medicine, 18: 61-69. DOI: http://dx.doi.org/10.1142/S0192415X90000095. Chiu, S.W., Wang. Z.M., Leung, T.M. & Moore, D. (2000). Nutritional value of Ganoderma extract and assessment of its genotoxicity and antigenotoxicity using comet assays of mouse lymphocytes. Food and Chemical Toxicology, 38: 173-178. DOI: http://dx.doi.org/10.1016/S0278-6915(99)00146-5. PDF. Lee, S.Y. & Rhee, H.M. (1990). Cardiovascular effects of mycelium extract of Ganoderma lucidum: inhibition of sympathetic outflow as a mechanism of its hypotensive action. Chemical and Pharmaceutical Bulletin, 38: 1359-1364. URL: http://ci.nii.ac.jp/els/110003628550.pdf?id=ART0004135359&type=pdf&lang=en&host=cinii&order_no=&ppv_type=0&lang_sw=&no=1306772089&cp=. Morigiwa, A., Kitabatake, K., Fujimoto,Y. & Ilkekawa, N. (1986). Angiotensin converting enzyme-inhibitory triterpenes from Ganoderma lucidum. Chemical and Pharmaceutical Bulletin, 34: 3025-3028. URL: http://www.journalarchive.jst.go.jp/jnlpdf.php?cdjournal=cpb1958&cdvol=34&noissue=7&startpage=3025&lang=en&from=jnlabstract. Kabir, Y., Kimura, S. & Tamura, T. (1988). Dietary effect of Ganoderma lucidum mushroom on blood pressure and lipid levels in spontaneously hypertensive rats (SHR). Journal of Nutritional Science and Vitaminology, 43: 433-438. URL: http://www.journalarchive.jst.go.jp/jnlpdf.php?cdjournal=jnsv1973&cdvol=34&noissue=4&startpage=433&lang=en&from=jnltoc. Shiao, M.S., Lin, L.J. & Yeh, S.F. (1988). Triterpenes in Ganoderma lucidum. Phytochemistry, 27: 873-875. DOI: http://dx.doi.org/10.1016/0031-9422(88)84110-4. Shiao, M.S., Lin, L.J. & Yeh, S.F. (1988). Triterpenes from Ganoderma lucidum. Phytochemistry, 27: 2911-2914. DOI: http://dx.doi.org/10.1016/0031-9422(88)80687-3. Lin, L.J., Shiao, M.S. & Yeh, S.F. (1988). Triterpenes from Ganoderma lucidum. Phytochemistry, 27: 2269-2271. DOI: http://dx.doi.org/10.1016/0031-9422(88)80140-7. Shimizu, A., Yano, T., Saito,Y. & Inada, Y. (1985). Isolation of an inhibitor of platelet aggregation from a fungus, Ganoderma lucidum. Chemical and Pharmaceutical Bulletin, 33: 3012-3015. URL: http://www.journalarchive.jst.go.jp/jnlpdf.php?cdjournal=cpb1958&cdvol=33&noissue=7&startpage=3012&lang=en&from=jnltoc. Kino, K., Yamashita, A., Yamaoka, K., Watanabe, J., Tanaka, S., Ko, K., Shimitzu, K. & Tsunoo, H. (1989). Isolation and characterization of a new immunomodulatory protein, ling zhi-8 (LZ-8), from Ganoderma lucidum. Journal of Biological Chemistry, 264: 472-478. PDF. Tanaka, S., Ko, K., Kino, K., Tsuchiya, K., Yamashita, A., Murasugi, A., Sakuma, S. & Tsunoo, H. (1989). Complete amino acid sequence of an immunomodulatory protein, ling zhi-8 (LZ-8). An immunomodulator from a fungus, Ganoderma lucidum, having similarity to immunoglobulin variable regions. Journal of Biological Chemistry, 264: 16372-16377. PDF. Khoda, H., Tokumoto, W., Sakamoto, K., Fujii, M., Hirai, Y., Tamasaki, K., Komoda, Y., Nakamure, H., Ishihara, S. & Uchida, M. (1985). The biologically active constituents of Ganoderma lucidum (Fr.) Karst. histamine release-inhibitory triterpenes. Chemical and Pharmaceutical Bulletin, 33: 1367-1374. URL: http://www.journalarchive.jst.go.jp/jnlpdf.php?cdjournal=cpb1958&cdvol=33&noissue=4&startpage=1367&lang=en&from=jnltoc. Tasaka, K., Akagi, M., Miyoshi, K., Mio, M. & Makino, T. (1988). Anti-allergic constituents in the culture medium of Ganoderma lucidum. (I). Inhibitory effect of oleic acid on histamine release. Agents and Actions, 23: 153-156. URL. Tasaka, K., Mio, M., Izushi, K., Akagi, M. & Makino, T. (1988). Anti-allergic constituents in the culture medium of Ganoderma lucidum. (II). The inhibitory effect of cyclooctasulfur on histamine release. Agents and Actions, 23: 157-160. URL. Tarlo, S.M., Bell, B., Srinivasan, J., Dolovich, J. & Hargreave, F.E. (1979). Human sensitization to Ganoderma antigen. Journal of Allergy and Clinical Immunology, 64: 43-49. URL. Cutten, A.E., Hasnain, S.M., Segedin, B.P., Bai, T.R. & McKay, E.J. (1988). The basidiomycete Ganoderma and asthma: collection, quantitation and immunogenicity of the spores. New Zealand Medical Journal, 101: 361-363. URL. Singh, A.B., Gupta, S.K., Pereira, B.M. & Prakash, D. (1995). Sensitization to Ganoderma lucidum in patients with respiratory allergy in India. Clinical and Experimental Allergy, 25: 440-447. DOI: http://dx.doi.org/10.1111/j.1365-2222.1995.tb01075.x. PDF. Min, B.S., Nakamura, N., Miyashiro, H., Bae, K.W. & Hattori, M. (1998). Triterpenes from the spores of Ganoderma lucidum and their inhibitory activity against HIV-1 protease. Chemical and Pharmaceutical Bulletin, 46: 1607-1612. PDF. El-Mekkawy, S., Meselhy, M.R., Nakamura, N., Tezuka, Y., Hattori, M., Kakiuchi, N., Shimotohno, K., Kawahata, T. & Otake, T. (1998). Phytochemistry, 49: 1651-1657. Taylor, M. & Reide, P. (1998). Crash Course in Pharmacology. Mosby, London. ISBN-10: 0723431256, ISBN-13: 978-0723431251.